I love it when I have the opportunity to try new things and share them with you. I love it even more when the opportunity to do try something new coincides perfectly with a project that I wanted to try needed to do anyway....finding my son a nightstand. 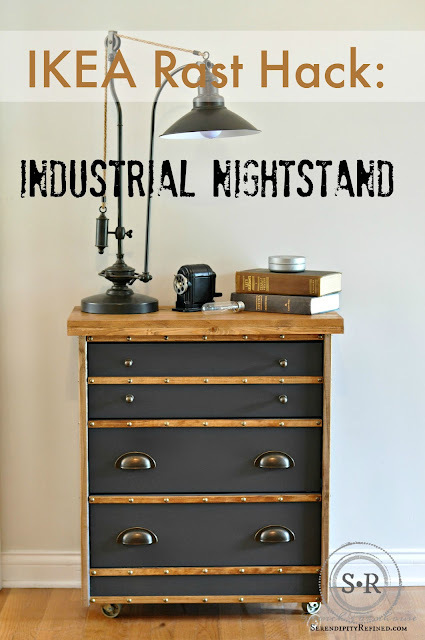 Let me introduce you to this wonderful little industrial-inspired nightstand that I made for my youngest son's first college apartment using an IKEA Rast dresser and supplies from Menards, Pittsburgh Paints and Hickory Hardware. A few weeks ago, I got an email asking if I wanted to join eight other bloggers for a "challenge." I thought to myself, "Are you kidding?! I LOVE a good challenge....after all, I'm the girl who's trying to make a farmhouse out of a 1950's ranch house"...but I digress. My youngest son is moving into his first college apartment this month and I have been desperately trying to figure out a sturdy, masculine, nightstand for him to use. Since this is going into a college apartment, I didn't want to spend a fortune for it but I also wanted it to be something that fit his style and would hold up to the abuse wear and tear that is to be expected in an apartment full of college guys. Just as I was about to give up and tell him that he'd have to use a set of plastic drawers as a nightstand, I got the email inviting me to be a part of this challenge. 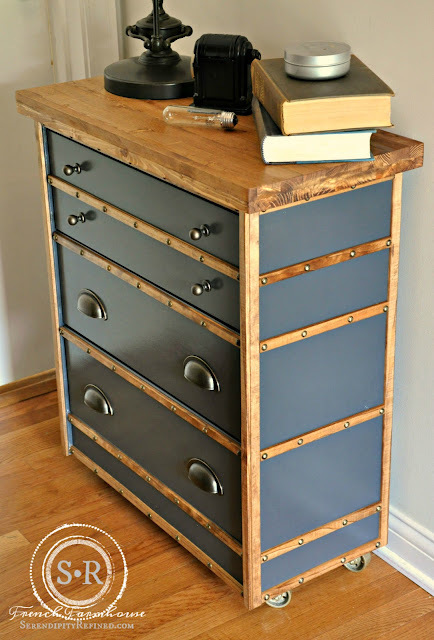 Menards teamed up with Hickory Hardware and Pittsburgh Paints to challenge nine bloggers (including me) to "hack" an IKEA Rast dresser. Needless to say, I'm "in"! As soon as I saw the dimensions of the Rast cabinet, I knew what I was going to do. I made a trip to my local Menards to purchase supplies using the gift cards that were provided to me for this challenge. I purchased (6) 8' pieces of flat screen molding, (1) 2 x 4, (2) pieces of 16" end glued poplar, (4) metal casters and (4) packages of decorative nail heads. 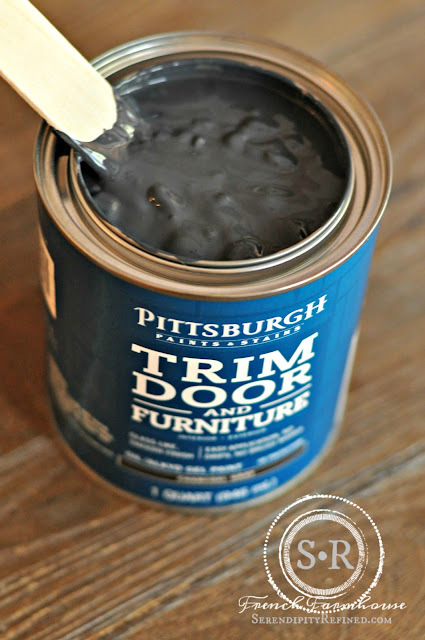 I also purchased the Pittsburgh Paints Trim Door & Furniture Paint and Hickory Hardware cup pulls and knobs. Before I tell you how I created the nightstand, let me just tell you that if you haven't been to Menards, you're missing out. I had been to a Menards once, a couple of years ago, with my sister. I didn't even realize that there was a Menards near me until this challenge. My first solo trip to Menards was 6:30 on a Tuesday morning and even though it was early and the coffee hadn't kicked in, I knew as soon as I walked through the doors that I had died and gone to DIY heaven. Okay, that's probably an exaggeration but they really do have everything for home DIY'ers; paint, hardware, lumber, tile, lighting, kitchen cabinets...the list goes on and on. In the spirit of full disclosure, I went back four times for this project.... not because I needed to but because I wanted to see what else they had! The hack itself was pretty simple. I built the dresser as shown on the instructions then made a few easy modifications. First, I turned the dresser upside down and used a scrap piece of 1x6 to fill in the toe kick space using wood glue and finishing nails. 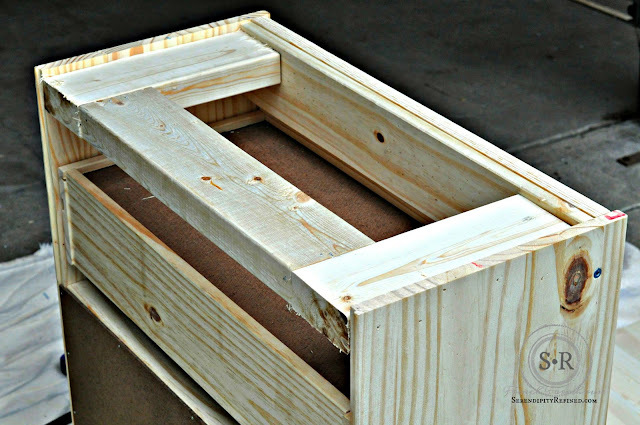 Then, I built a bracing frame out of a 2 x 4 set 3/8 inch below the sides so that I would have a place to attach the casters. This frame was also glued and nailed in place. Now let's talk about the paint that I used on this project. It's a brand new line of trim, door and furniture paint recently introduced by Pittsburgh paints. 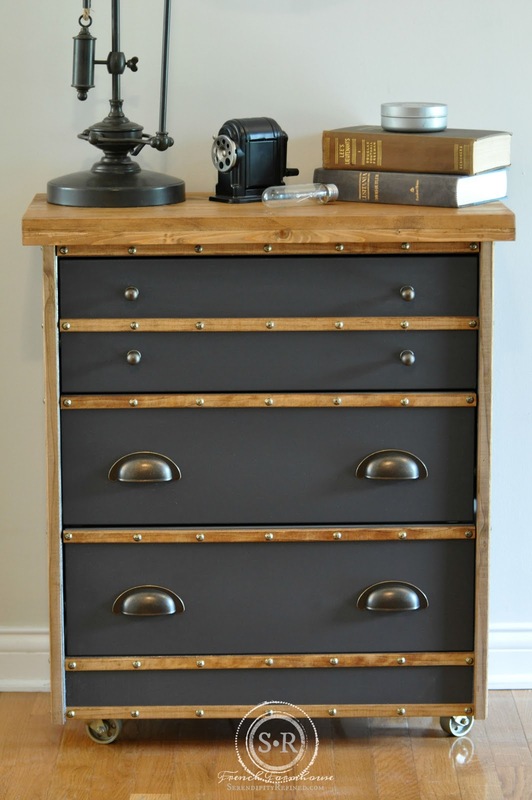 I chose charcoal gray for this piece. The guys in the Menards paint department explained that the paint that it is oil based and that since I was using it on new wood, I would need to use an oil based primer first. TIP: have primer tinted to match your paint to make coverage easier. The paint is is also a gel paint which means that it's thick like pudding,covers in one coat, and dries to a hard, glossy finish. 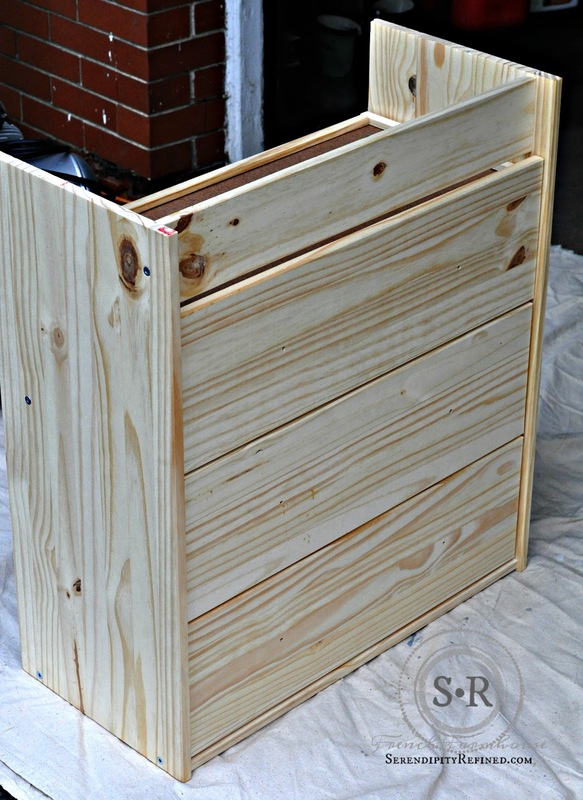 It is also oil based which means that it should be applied in a well ventilated area so, after I filled all of the nail holes and sanded them smooth, I moved my cabinet outside and primed it. Then, I sanded again with a fine sanding sponge so that the finish would be nice and smooth. 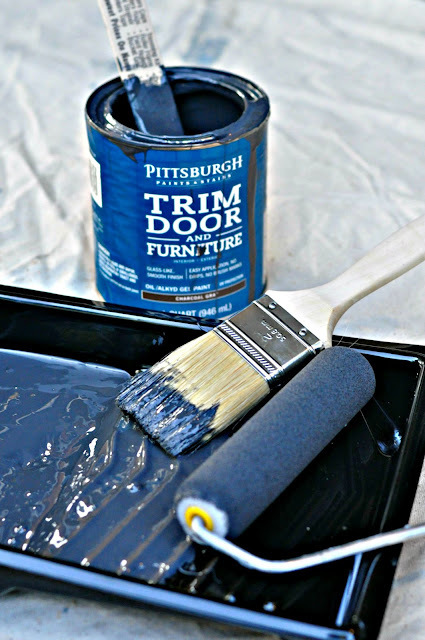 I used a china bristle brush and a foam roller to apply the paint. It really did cover in just one coat! While the paint was drying, I cut the poplar top leaving a 1 1/2 inch overhang in the front and on the sides. I stained the top and the strips of screen molding and spray painted the casters gold. I used wood glue and finishing nails to attach the top. Then, I cut strips of screen mold for the corners and the tops of the drawers as well as an extra piece to make the top drawer look like two small drawers. When it came time to choose the hardware for this piece, I had a hard time making up my mind. If you follow Serendipity Refined on Instagram or Facebook, you know that I was amazed at the selection of Hickory Hardware that I had to choose from. 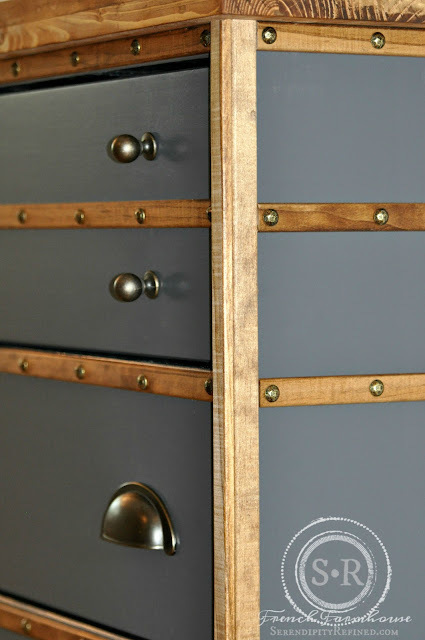 So much so, in fact, that I actually went back twice before deciding on the bronze gold cup pulls and knobs that I finally used on this project. 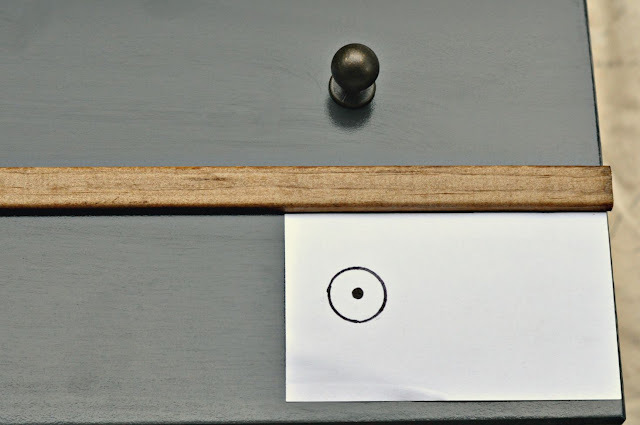 TIP: When drilling doors or drawers for hardware, make a template out of a piece of paper or an index card to ensure that the spacing is consistent. After the paint was dry, I attached the screen molding using trim nails for the corners and decorative nail heads and wood glue on the drawers. As for the challenge part of this challenge, I need your help! There's a contest involved. It's up to YOU, my readers, to help decide who wins this challenge. I don't have the link for voting just yet but I'll share then on Facebook and the blog just as soon as I know. Some of the other bloggers who are participating in this challenge are friends of mine so I know for sure that there will be some amazing projects involved. So, while I'd love to win this challenge and while I hope that you love my project the most, what I'm asking is that you VOTE for whichever project you feel is the best. That's it...JUST VOTE.